A Borderline Mom: Dawn Power Clean Helps Moms Save Time! I absolutely hate hate hate doing dishes. Right now I don't have a dishwasher, so all dishes must be washed by hand, which I absolutely loathe, but of course, I can't expect my SO to do them all the time. (Plus he tends to leave the pots and pans because he "forgets.) So, between my abhorrence for doing dishes and not wanting to waste time on it when there are many other things I need to and want to be doing, the idea that Dawn now helps me save time is awesome! The theory behind the new Power Clean line is that by soaking your dishes for only five minutes, it's the same effect of soaking them overnight. "Discover DAWN’S BEST CLEAN with micro-scrubbing enzymes that power through food messes with ease, from everyday grease to tough lasagna dishes! 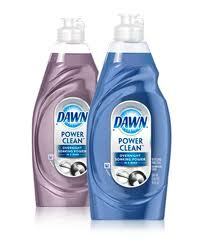 Dawn Power Clean is available in Refreshing Rain Scent and Vibrant Fresh Scent." I know if I have a dirty pan, I will soak it with dish soap overnight so I don't have to use as much elbow grease when washing it. So, I took the challenge. I made meatloaf and normally I would soak the greasy pan overnight, but used the dawn instead and filled the whole sink with hot water and Dawn Power Clean. I didn't time it EXACTLY, but by the time I had the table and cabinets cleared and cleaned and was ready to start the dishes, most of the gunk on the pan had loosened up! I was able to wash all the dishes at once, which made for one less thing I had to do later. In regards to saving time, when it comes to keeping the kitchen clean, that's always important because we always sit down at the table for meals together. It's tough to keep the counters and table clutter free, but it's easy to save time cleaning if what's underneath the clutter is already clean. When I cook, I try to clean up as I go along- especially the stove. SOMEONE I live with (won't say who) will spill on the stove when he's cooking and it gets dried on and stays until I cook. I find that if you wipe things up right after they happen, it makes later cleaning a breeze! What helpful time saving tips do you have when it comes to the kitchen? And on another useful note- when I received my Dawn Power Clean in the mail to try, I was getting ready to wash my lawn chairs and put them out for the season. They were covered in dirt. I used the Dawn and some hot water and it cleaned them beautifully!! !